Today let's talk about what you're playing for. I'm taking about prizes and prestige! 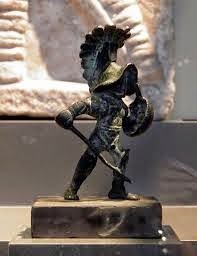 Trophy example. SCGG Trophy is in the works. First off let us remind you that this event will hopefully be a annual thing. As such we want you to know that being in the top spots of the tournaments will immortalize your name in the history books. Year One is where everything changed and the world of tabletop gaming in Utah was shaken to the core. Will you take up the challenge? Will you be #1 for 2014? Not only will you go home knowing that you helped support a great event but for some of you lucky gladiators there will also be a trophy to put on your mantle. For the 40K and four main Warmachine/Hordes tournaments we will have trophies for the top 3 players. Also for Salty Dwarf folks we will also have trophies for you paint brush gladiators. I should also mention that along with trophies we will also have a cash prize too. As we promote this event at FLGS we are going to ask for sponsor items for random prizes to everyone who plays at this event. We want this to be a great experience for everyone who attends. More details to come. If you know anyone who'd like to sponsor prizes please let us know scgladiatorgames@gmail.com. 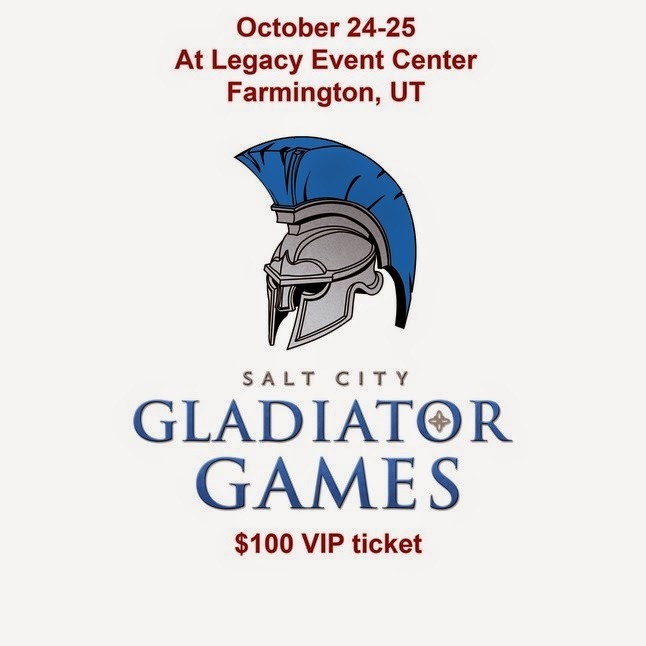 Tickets for the Salt City Gladiator Games are up and available on our store. Click here to access the store. You'll need to purchase a pass to get the link for registration. The registration link will be emailed out July 31st for regular weekend pass and July 28th for VIP passes. Remember that VIP are limited quantity so get one for yourself before they are gone. The Geek Garage will be hosting the painting competition for SCGG. We’d like to invite you all to come and participate in the second Salty Dwarf Painting Competition of which will hopefully be an annual event for the Gladiator Games. Fall 2014 Salty Dwarf Painting Competition! October 25th at the Salt City Gladiator Games in Farmington, UT. Note: This competition is open to all miniature model companies and ranges. After some great questions brought up from the community we have decided to get a bit more specific with categorization and judging criteria. Judging Criteria: Technical ability/execution. Artistic quality. Defined: Smaller figure or animal-mounted figure, such as a knight on a horse, which fall within the size restriction. This includes base, mount, and appendages. A competition judge will rule on any bits, such as a pole, extending beyond the size restriction, at time of entry. Size Restriction: 3x3x3 inches, excluding base. Defined as: All vehicles and machines with crew. This includes all tanks, ships, siege engines, all weaponry that contains or is run by one or more crew figures. Multiple freestanding figures (as in crew) must include unifying base, board, or movement tray. Defined as: Single Figures that are larger than Single Figure restrictions. Large monsters, dragons, statues, busts, large scale miniatures, etc. Defined: Emphasis is on the display as a focused scene telling a story with figures. This may include battle scenes or other diorama displays. Must be on a unified base, figures do not need to be permanently attached to the base, but judges will take into account the technical aspect of the figures as presented with the base. Technical Ability/Execution- The technical proficiency used in the painting and modeling of the entry. Obvious technical faults are mold lines, sloppy joins, rough primer, and/or sloppy paint. Artistic Quality- The artistic effects of the piece, including color choices, added detail work, pose, basing, cohesiveness, and the overall effectiveness of the artistic choices made. Updated Rules... these rules are basically identical to the GenCon general painting competition rules and definitions. Thanks to Amy Stegmann, GenConMinipainting.com and the MHE crew for the rules and category definitions. -Entrant must have painted the fig themselves. No commissions. -Entries must be received by 12 noon of October 25th. -The fig will be on display throughout the day. DO NOT enter a fig if you plan to use it in the tourney as well. -Entrant must be present to collect the prize at the end of the Salty Dwarf event. Winners will be announced between 5pm and 7pm Saturday. -You do not have to play in the tournaments to enter the painting competition. -By entering the contest, you give the Geek Garage rights and consent to post/publish pictures of the figures and Artists where we deem necessary. *Pre-Registration details: Send Pay Pal payment to thegeekgarage@gmail.com leaving a note with a name and category along with payment. Now grab those brushes and start slinging some paint!! Only a few more days until tickets go on sale for the Gladiator Games. We are working hard to get all the gears and cogs in motion for this to be a successful event. 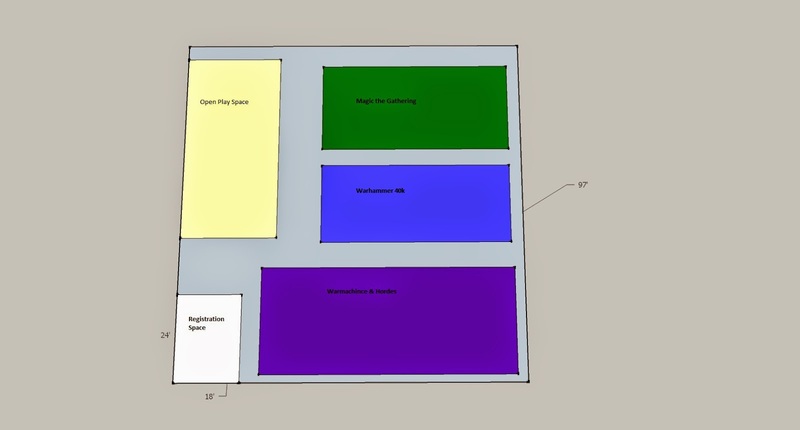 During our floor planning meeting we discovered that we will have some extra space available that we will use for open play events. *Please note that any attendees for open play area will be required to purchase a weekend pass. This will help go towards the table rental and table tops. Space is limited and will be filled on a first come first serve basis. After four rounds the event will end, and the top 16 players will qualify for the masters final on Saturday. The event will be played with timed turns with casual time limits. This event is designed for newer players, but any player wanting a more casual environment are welcome to participate. Bring a 35 point list with 6 beast/jack points, but NO WARCASTER. Every round you’ll be given the option of two casters from outside of your faction to lead your forces. All warcaster/warlock rules will change to reflect which side of the game you’re playing. Warcaster models will be provided for you. One of the funnest formats in Warmachine! There will be NO painting requirement for this event. Master Craftsman will still be awarded to the player with the best fully painted list. As we get closer to the day tickets go on sale we've had a few inquiries as to the details of the event. Here are the prices for the event (subject to change at any time). VIPs will get early access to events registration and a guaranteed slot for whichever tournament they are interested in. At the event VIPs will have special access to drinks and snacks in the registration area and get a swag bag (details coming soon). On Friday VIPs will join the Salt City Gladiators crew as we go out to dinner and discuss all the events of the day. *We will pay for the meal but alcoholic drinks will be on your tab. This pass will get you in the event both Friday and Saturday and access to events registration. You will need a weekend pass to play in any of the tournaments at the event. This pass is good for both Friday and Saturday and for those ONLY looking to participate in the Magic Tournament. This pass will not get you into the 40k or WM/H tournaments. See event's page for details. We are glad to help host the 2nd Salty Dwarf Painting Competition. Have you looked at our events page lately? We've been working to add all the information you need to know so you can practice for the main event. That said, tickets will go on sale on July 25th. We are working on the registration system as we speak. What can you do to help? Share our Facebook page with your friends, take the flyer to your local store, and get those dice warmed up.